in the Cal State University, Long Beach Pyramid. The Catholic Schools Academic Decathlon was founded in September, 1989 by Dr. Mark Ryan who was then a junior high teacher at St. Aloysius School in south-central Los Angeles. Dr. Ryan had a vision for an academic event to parallel the athletic competitions so prevalent in schools. What began as a tiny competition involving a handful of schools from the greater Los Angeles area has grown to become a statewide event involving Catholic junior high students from across the United States. 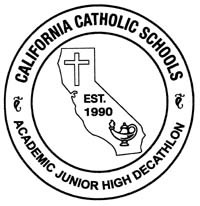 The Decathlon is now under the guiding jurisdiction of the California Catholic State Superintendents Curriculum Committee. The Academic Junior High Decathlon is a competition for students in grades 6-8. There are ten events. Two are collaborative team efforts – a logic quiz with 20 rigorous thinking problems, and a super quiz with 50 multiple choice questions on five broad academic themes. The remaining eight events test individual knowledge of the Roman Catholic doctrine, English, Literature, Science, Mathematics, Current Events, Social Studies, and Fine Arts (Art and Music). Awards are given for individual and team performance, and the winning school team from each geographic diocese competes in a state championship the first Saturday of May each year.